If I never have to turn compost in my life again it will be a great thing. I put together my first ever small pile of compost a month ago, turned it once and realised I never want to waste time turning compost again, ever, if I could. Previously I’d only done Bokashi composting and had never really taken time to do a regular composting pile! At the same time I didn’t want to leave it for half a year to break down. After much research I mostly saw expensive ($300+ !) commercial bins or tumbler composting systems (which still require turning albeit much easier). Slow composting : Minimal attention but takes a long time. Breaks down a lot which can be a good thing as you’re not seeing chunks of last months dinner scraps in there. Doesn’t always kill weeds / seeds / pathogens. Pile it and leave it so generally free / cheap as a solution. But given I want instant gratification this was not an option. Which left…. Quick composting : Hot composting = Lots of aeration required = attention and frequently turning the pile. Kills seeds,weeds and some pathogens. The options with hot composting were to purchase VERY expensive aerated bins Eg Aerobin. Tumblers seem to be the middle ground but limitations on how much you can add before it becomes too bulky. Plus you have to still go turn the tumbler every few days. The static bins still take a while to compost but most have little to no aeration, so to expedite composting some form of aeration would need to be implemented. So no matter where I looked, if I wanted compost quickly I either had to dish out a lot of money or waste time and energy turning the pile every few days. My Mission : To get the speed and results of hot composting with the effort of cold composting. There were many methods stating they got compost in 18-30 days. Every single one of them involved turning the heap every 3-4 days. I decided to try and get simlar results but with absolutely ZERO turning. I was willing to wait a week or so more but considered this a minor payoff for not having to turn the pile at all. I only came across two methods that came close to what I was trying to achieve. A few people laid pvc pipes with holes, horizontally through open piles of composting material and allowed it to sink as the pile broke down. A great system however these piles were generally not insulated so the outer parts of the pile did not achieve the high temperatures required for hot composting. They also lost a lot of moisture to the air. At some point it would ultimately need to be turned so the extremities could compost too. Meaning only the middle of the pile was usable at the end of the initial composting period. These systems were quicker than cold composting however they still took many months before the compost was ready. Some large scale community gardens had machines push humungous piles of dirt and organic matter atop long pvc pipes that had holes drilled into them The machines would then move them several months later to an adjacent pile. (Obviously not something I could do but the concept was a good starting point. Plus I thought the air entering the pipe at the bottom / ground level had limited reach within the pile. So taking a bit of knowledge from various parts of the interwebs I devised my own little self aerated hot composting system. Have to use that engineering degree for something right? My criteria were it had to be rapid, it had to be free (or ridiculously cheap) and virtually zero interaction between adding organic material to be broken down to the removal of compost to add to the garden. Don’t get caught up with the details, sizes and small stuff of the build. In fact ignore it altogether apart from looking over the materials list. The most important thing is to watch the video and embrace the METHOD, as the concept of what I’m trying to do here is the thing you want to take away from all this and use and adapt to what you have available. various lengths of recycled PVC pipe ~50mm (2″) diameter ** Max length of each will be the diagonal of a cube which is roughly 1.7 x length of side of cube. 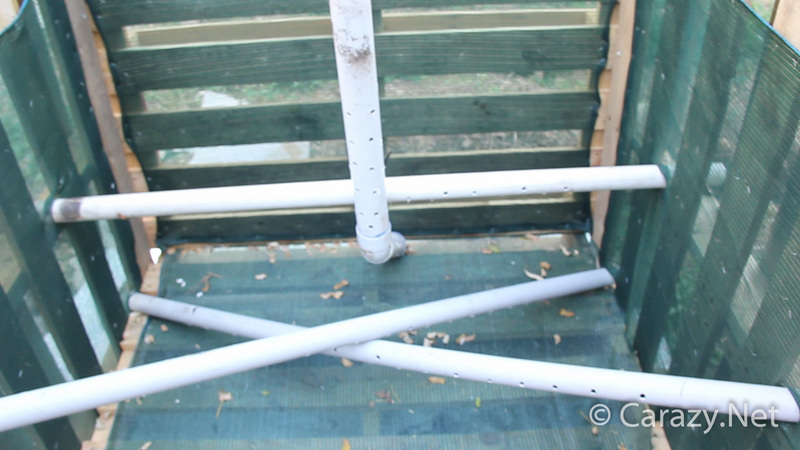 But you can make almost any length or shape of recycled PVC pipe work. With the help of a friend (or clamps), position the pallets in the formation of a cube. I did this because my pallets were slightly different in size so i had to ensure touching sides were of similar length. Label the sides and top /bottom so you assemble it in the same order. Screw the sides and back to the base. Then screw the sides and back to each other where they meet. Remove the front panel and keep it to the side. Drill 8-10mm holes on what will be the lower half of the pipes and slide the PVC lengths from one side panel through to the other. **Note: You want to ensure they are angled to create a chimney /convection effect. Hint: Cut a cross shape in the cardboard up high and slide the pipe through it and stab towards the baseline of the opposite side. Then cut a cross in the cardboard there and feed it through to the outside of the pallet cube. Secure with zip ties or wire. Keep an area clear of pipes in the front where you can easily shovel stuff out when you are removing the composted material. Don’t go beserk with pipes as too much air can cool the pile as well as making it difficult to rake out material later. Once pipes are done. replace the front panel ensuring the cardboard is on that too. Fill with compost, cover with tarp and WALK AWAY ! I’m pretty sure others have done similar things out there, however if they have it either hasn’t been very well documented or is extremely hard to find. I believe everyone should share ideas, develop them further and add to the brain trust. How my setup differs from the ones I’ve seen elsewhere and I believe is an improvement is the following. Firstly my pipes are angled, therefore creating a constant convection current whilst there is heat in the pile. The other systems I saw looked more like an ebb and flow system. The pipes in my system are also fixed and all throughout the composting space so that as the material breaks down and naturally compacts, new material is exposed to the aerated parts deep within the pile. This bin is also insulated with cardboard around it’s perimeter and a tarp on top giving greater chance that the material on the sides and top will attain the high temps of hot composting required to kill off seeds, weeds and pathogens from the manures I add. The base pallet allows air flow underneath providing further aeration as well as allowing excess water to drain out. Combined with the cardboard wrapped around the sides this creates a stack / chimney effect through the whole bin. The heat rising through the bin creates a draw from the bottom. Although fairly compacted by moisture, the irregularity of the varied sizes and shapes of the composting material provides small gaps between material to allow air to seep upwards. The downside is that microbes from the dirt can’t get into the pile but is easily remedied by a few shovelfuls of dirt while adding compost. Normally earthworms will move in from the ground too, once the intense heat subsides but I plan on using this compost as soon as it’s done and the earthworms can do the finishing in situ. I’ll update with details of how my experiment goes over the weeks to come. I plan on pouring Bokashi Juice over the whole pile at the end to allow the good anaerobic bacteria to do some finishing for the small patches that had an aerobic start but then compacted and could do with a bit more work. In the interests of a purely aerobic experiment I decided to not do it with this batch. That way those who don’t have Bokashi bins can utilise this system if it works. Hopefully this “Carazy Composting Method” helps some of you and I hope you put any projects you do up on the interwebs!